Bloom was commissioned by the Nevada Museum of Art and appeared as an installation from Feb. 16 to June 16, 2013. (requires Flash, allow 30 seconds for data to load). Seismic Signals: An Interview with Ken GoldbergThe Atlantic, March 2013. 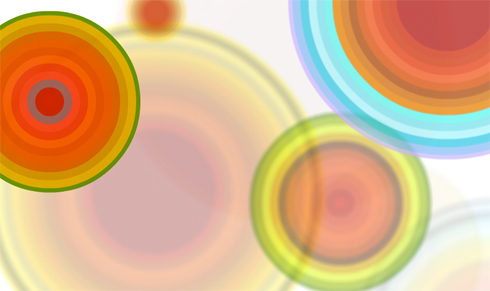 Bloom transforms seismic data into an exuberant display of color. A seismometer at the Hayward Fault continuously measures the Earth's motion and transmits this data to an installation, where it is displayed as a field of unpredictable circular blooms. This work was commissioned by the Nevada Museum of Art and is dedicated to Color Field painter Kenneth Noland. It appeared as an installation during 2013. We were delighted to collaborate with Ken Goldberg and his group at Berkeley. Bloom uses the same type of data as Ken's 1999 mori project, but imagined with a completely different mood. Rather than display an ominous view of the earth's power, Bloom creates a joyful portrait of the planet's energy. Because the work runs off of live seismic data—nature's own random number generator!—it is never the same twice. Some details from the piece are shown below. Thanks to JoAnne Northrup and the museum staff, Catharine Clark of the Catharine Clark Gallery, Richard Allen, Doug Neuhouser, and Peggy Hellweg of the UC Berkeley Seismological Laboratory for ongoing access to their stream of live seismic data. We also thank David Nachum, Vijay Vasudevan, Woj Matusek for contributions to earlier versions and Anne Wagner for insightful comments.